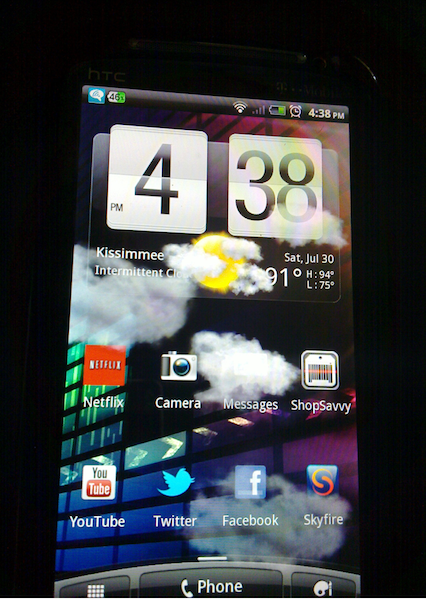 I’ve been meaning to get this up for the past few days…honestly…but I wanted to send a quick reminder to HTC Sensation 4G owners that Netflix is now available! Grab it and get your Netflix on! Just go to swype.com and register. It was a simple off-market download and this version of Swype works wonderful on the Sensation. IMO, much better than the Touch Input crap that is preloaded. Unfortunately, it says you have to root your phone to be able to download it. Um, my Sensation is not rooted, and I had no problem installing the swype beta. I’ve been using swype since my HD2, even had it when I switched it to android, just sign up for the beta and enjoy the greatness that is swype. Can anyone tell me how this works? Obviously you download the app and if you have a subscription to Netflix then you can watch it on your phone. But my question is, how much data, if any, of my plan will this use at a time? I just got my Sensation and upon doing so signed up for the 2GB data plan. I am not a heavy user so this should be enough for me normally, but if streaming Netflix is going to sap all my data then either I need to pass on the app or up my plan. I appreciate the assistance! I watched about 40 minutes while waiting around at school yesterday, and it was a somewhere around 250 MB. I would say if you aren’t sure how much data you use, try to keep to wifi when possible. I know there are charts that give a general idea of how much data different apps like Netflix use, and it’ll tell you in hours. I wouldn’t recommend watching Netflix too often on a 2GB plan; a normal TV episode will run you ~200MB per episode. WiFi should be your best friend. I agree with Terrance and Brian. I roughly hit about 200mb per tv episode also. I also just downgraded my dataplan to 2gb. I don’t plan to watch a lot of netflix on my phone though. Since you are NOT a heavy user I don’t expect you will run into any problems. Getting an error when trying to install from the market. I installed it from the web through http://www.market.android.com and search netflix. I was already signed in, and it installed right to my Sensation. Signed in and started streaming no problem. Had to uninstall the um, “previous” version. Now market version installs ok. If you download the apk from xda and get gingerbread on your mytouch 4G, it installs and plays just fine as well. I tried to get it to run when i still had froyo, it would install and run, but never would actually stream anything. Thanks for the info ex-sklx09-user and Terence. Going to check it out. As for gingerbread, I’m going to hold off a week or two until I read the review’s on how the MT4G is handling gingerbread. How do you like it. Any performance issues? I remember when I upgraded my Motorola cliq from android 1:5 to 2.1 my phone took a big hit in performance. It really slowed down. Runs as fast as ever, no constant issues at all, i did have 2 random restarts the first day, but they were never when i was using the phone, i would just pick it up and it would have the “tell HTC” alert to send a report on what had restarted. but this hasn’t happened again since that day. My battery is lasting as much as twice as long as it used to as well. the only thing i regret about the update is that it wiped my phone clean and i lost all my texts, settings and applications. i had to try and remember what i had installed and how i had my screens set up. thankfully it didn’t also wipe the SD card. there are minor aesthetic changes to how some things are displayed like texts, but its all for the better. Thanks a lot. Just what I needed to hear. Love having it on my Sensation. Any one know if its available for the MyTouch 4G (not the slide)? A special copy? Well aren’t you ah …. well, special. Kidding. What do you mean a special copy? My husband was able to download Netflix to his Vibrant from the Market, and he has FroYo. The Vibrant (and all Galaxy S phones, I believe) are one of the 24 phones for which the app is available. No modding required, unless you’re anxious to get Gingerbread. Kind of funny since Netflix has lost so many customers and/or “streamers” due to their new program restructuring and raised prices…not to mention their poor online library. Oh well, cheers to those of you that actually want this ! They haven’t lost me cause my plan hasn’t changed at all. I also have been with netflix waaaay before they even started streaming. I get unlimited DVDs, 3 DVDs at a time. That’s the package I originally signed up for. My pricing hasn’t changed ever and when they added the streaming the streaming to my account and didn’t effect pricing so streaming is basically free for me. Guess what I’m saying is heck yeah, I want it. Totally feel your pain. My husband has Netflix on his Vibrant and it plays fantastic, even at the farthest end of the house from the router (he has the 200 MB data plan, so WiFi is a must). I have to use PlayOn to run Netflix on my G2x and the experience isn’t as good. HOW CAN I FIX THE VERY LOW SPEAKER SOUND on my HTC SENSATION?? the speaker volume is just too low. Agreed. You might be able to increase speaker volume by rooting your phone. I’m a noob to modding, but I’ve heard that it’s possible to do things like increase speaker volume by rooting. OMG! I can’t believe the reviewers haven’t made a big issue of the lack of volume. Thought my phone was defective the first time I used the the speaker. I just watch use my Bluetooth while watching netflix. The ultimate Netflix app for the T-Mobile HTC Sensation is the Netflix1.3 H264 Video Data Master Wizard app made by a guy name Sprintusa found here http://forum.ppcgeeks.com/android-apps-games/146066-netflix1-3-h264-bluestar-data-master-wizard-nobody-beats-wizard-2nd-none.html ….! Dave I know that you don’t like links, but these Netflix 1.3 apps are the real deal, no fake, no flam flame stuff…. 2./ Volume Level [+14], Set the Volume Level to your desired level, be careful . I can’t find that app in the market. Where did you download it from? Are you referring to the speakerphone??? This is what I’ve done. I’ve unchecked the “Flip for Speaker” option in the Sound settings. It doesn’t work and is totally useless as far as I’m concerned. When I make a call, or accept one, and want the speakerphone on I press the speaker option on the call screen to activate the speakerphone and it works just fine. I had hoped the upgrade to 2.3.4 would fix the speakerphone issue, but it didn’t. awwwwwwwwwwwwww i’m mad late but super excited yessss! wooo hoooo wooo hooo, do the booty dance do the booty dance! yes!